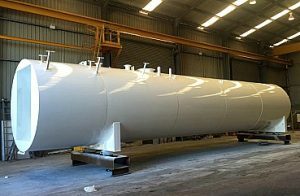 TW Woods were engaged by Tank Solutions to blast and paint a 70000L tank. TW Woods specialise in abrasive blasting and painting of fuel tanks and chemical tanks. The tanks can range in size from small 2000L tanks to large 150000L tanks. Tanks are coated in epoxy paint systems.